The blends below have been selected to assist your therapeutic treatments for joint pain, joint injury and the therapeutic maintenance of joints, cartilage and tendons. The Black Pepper, Cumin Seed and Clove Bud in our Intensive Heat Massage Oil, will create a luminous glowing warmth deep inside your painful and aching joints. Used as part of your Physical Massage and Therapy Treatments, this Massage Blend will help with the pain and discomfort of Arthritis, Rheumatism, and any Long Term injury. Read more about the Intensive Heat blend or place an order here. Pre Sports Rub is blended with Spearmint, Cajuput and Ginger to create a deeply penetrating ‘Menthol Vapour’ type effect. Pre Sports Massage blend should be used prior to rigorous activity. As any sports coach will confirm, stretching, limbering and warming up prior to exercise is essential to prevent injury. Use this massage blend for all pre sports exercises, and for loosening stiff and tense joints muscles. Read more about the Pre-Sports Rub or place an order here. Peeled Orange supplies Professional Massage Oils to the UK and worldwide formassage therapy and encouragement of health and well-being. Our aromatherapy oil blends contain pure essential oils chosen to assist the therapeutic treatment of sports injuries, stress, fatigue , back ache and to aid preparation for sports activities. 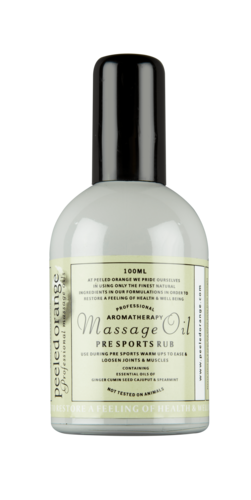 We offer great massage therapy supply deals for therapists - try our therapeutic massage essential oil blends for sports therapy massage. Our blends use pure essential oil to produce a professional quality massage therapy product.